To help your agency manage email communications, use Saved Content to keep and reuse messages you send often. Saved Content lets you create reusable email messages in Email Marketing and Automated Workflow. You can create your own saved content or use AgencyBloc’s pre-built content. You can use saved content to create a signature or a table of product or carrier information. 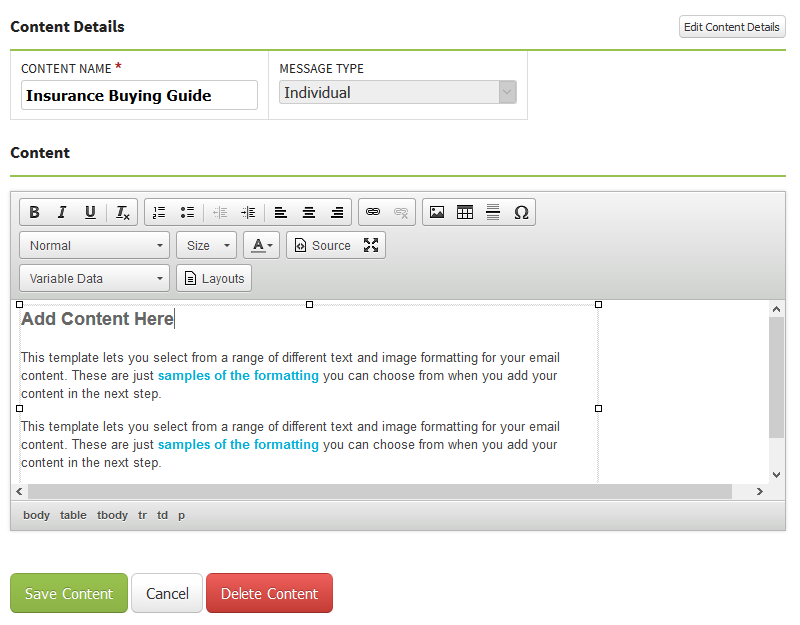 Saved Content is a pre-built message that can be quickly inserted into the email editor when you are creating emails. Pull from Saved Content to reduce the time it takes to compose emails. You can create your own Saved Content or start with AgencyBloc’s pre-built content. Create just text, a combination of text and images, or whole email layouts with text, variable data, and images. Any user with access to Email Marketing or Automated Workflow can create, edit, or delete saved content. Saved content is available in both Email Marketing and Automated workflow. 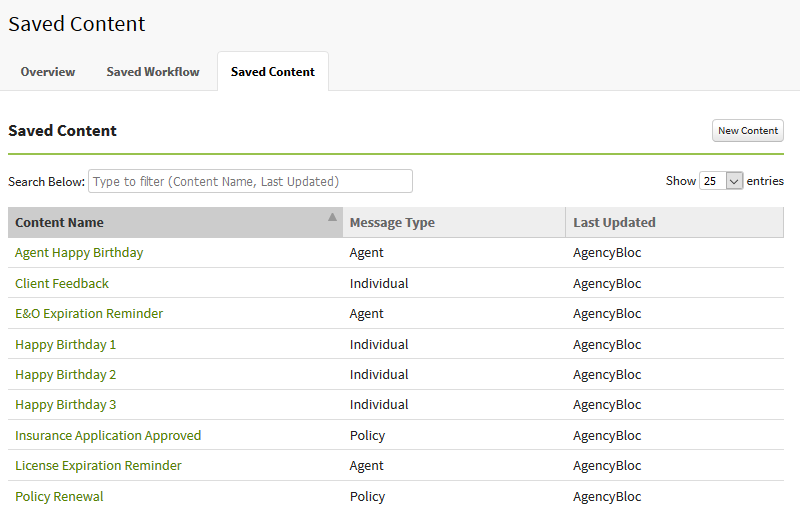 You'll find AgencyBloc’s pre-built content in the Saved Content tab for both Email Marketing and Automated Workflow. Your Saved Content - content created by you or others in your agency. Content Name: Give your content a unique and identifiable name so you can easily recognize it in a drop down menu. Message Type: Specify the audience/trigger type for your content. Last Updated: The user that last updated the saved content. AgencyBloc includes pre-built industry specific emails to give you a head start. You can use these emails to fit your needs based on individuals, policies, and agents. Also, our pre-built content gives you an idea of what emails to start with, and you can build from there. While you can’t edit or delete AgencyBloc pre-built content, you can make changes and then save it as your own. Select 'Save As' and any edits you make will create new saved content. To work with saved content, head to Email Marketing or Automated Workflow, then click the Saved Content tab. Create the saved content you plan to use before setting up email campaigns or automated workflows. Create, edit, or delete your saved content. Use the search below box to filter your saved Content. To sort items, simply click the column heading. Go to Email Marketing or Automated Workflow and then select the Saved Content tab. Enter a Content Name and set the Message Type. Click ‘Save & Edit Content’. Your selection of Message Type determines when you’ll see your items in the Saved Content drop down in the email editor. You can add and format text, images, and variable data. Also, you can use layouts button to add structure to your emails. Select the Save Content when you’re finished. To edit your saved content, simply click on the content name in the list and you can start editing. If you need to change the content details, select the Edit Content Details. Note: changing from one message type to another will reset your message and you’ll lose the email content you have set up. So, make sure to back up any of your content before changing the message type. For example, changing a message type from individual to agent. To delete, open the Saved Content you wish to delete and select the Delete option below the editor. Note: AgencyBloc’s pre-built content can’t be deleted. To insert saved content into an email for either Email Marketing or Automated Workflow, click on the Saved Content option in the editor toolbar. Saved Content is split between Your Saved Content and AgencyBloc Saved Content. Select the piece you wish to insert and it drops into the email editor. Note: if you don't see the Saved Content icon in the editor toolbar, you may need to clear your browser cache. For instructions, check out article on clearing your browser's cache. Saved content displays in the drop down based on the area you are in and message type you set for that piece of saved content. For example, if you’ve created saved content in Email Marketing with a message type of Policy, you’ll only see that item in the drop down when creating Email Campaigns for Policyholders. Can I use layouts inside saved content? Yep, feel free to insert a layout when creating saved content as a starting point for the structure of your email. Click the button labeled layouts to insert a predefined email layout to create a structure for your content. You can also start with AgencyBloc's pre-built content to structure your content. Can I use HTML in saved content? Sure thing. Click the ’Source’ icon to change the editor so you can view or edit HTML. Click the icon again to change the view back to the normal editor. Can I add an attachment to saved content? Adding files like PDF’s, documents, or spreadsheets is not available in saved content or email campaigns. We suggest linking to a document stored on your website or a web storage service. Is it possible to insert multiple pieces of saved content into one email? While you may not do this on a regular basis, you can insert multiples pieces of saved content while editing an email. Just make sure you insert the saved content in an appropriate order and test the email to make sure it looks okay. If I make changes to my saved content, does it impact email campaigns where I’ve used that saved content? Making changes to your saved content does not impact any existing emails or campaigns where you have used that content. Think of using saved content like copying and pasting from once place to another.